KIEV, Ukraine -- There’s a saying in Ukraine about the four stages of being poor. It goes like this: First, you don’t have any hryvnias (the Ukrainian currency). Second, you don’t have any food. Third, you don’t have any dollars. And finally, you don’t have your $2 bill. For Ukrainians, dollars are a precious and jealously guarded rainy-day commodity. And for whatever reason, when the U.S. reintroduced the $2 bill in 1976, notes dated from that year became a popular good luck charm. Many Ukrainians still keep a $2 bill from 1976 in their wallet, with no intention of ever spending it. Many Ukrainians were exchanging their $2 bills. Some said it was a sign of how desperate the situation had become in the post-Soviet country. One Ukrainian journalist saw it more symbolically. “They were cashing in on the American dream,” she said. Ukrainian proclivity for American culture runs deeper than affinities for Big Macs, Nikes, and Hollywood flicks. In the quarter-century since the fall of the Soviet Union, Ukraine has gone through revolutions and war to build a functioning democracy and free itself from Russian vassalage. Accordingly, for many Ukrainians, embracing American culture is a symbolic way to resist Moscow dating back to the Cold War. Even today, Ukrainian rock bands sometimes play classic rock hits as a throwback to the Soviet days, when Western music was banned and rebellious musicians would sneak Western rock songs into their sets to the delight of crowds. 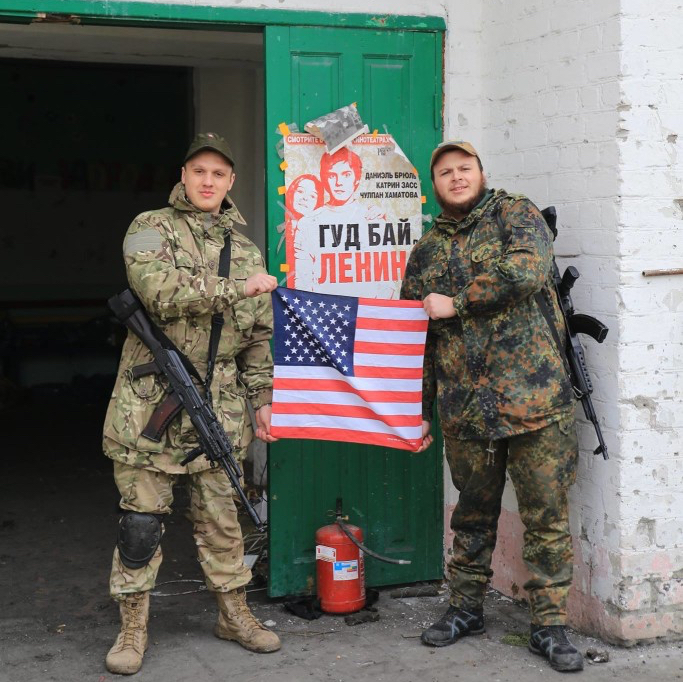 For some Ukrainian soldiers on the front lines of the ongoing war against Russian-backed separatists, American cultural symbols became a way to get under the enemy’s skin. Over the summer in the front-line village of Artemivsk, four Ukrainian soldiers raised the Ukrainian flag in a pose remindful of the famous image of U.S. Marines raising the flag at Iwo Jima. One soldier in the photo was Denys Antipov, commander of a recon drone platoon in the 81st Airborne Brigade. “Morale is good,” Antipov told The Daily Signal in an interview, describing conditions on the front line. “It’s the future Kremlin flag photo,” he said. In Pisky, a front-line city just outside the apocalyptic remains of the Donetsk airport, a Ukrainian soldier manning a machine gun emplacement in the trenches wore a T-shirt trumpeting the Ronald Reagan Presidential Library. The soldier said he bought the shirt in Kiev and was wearing it as a statement against Russia. They taped a paper printout with the U.S. senator’s picture to a power pole to make it official. Canadian journalist and filmmaker Christian Borys asked the soldiers when they were going to name a street after President Barack Obama. “When he sends us weapons,” more than one replied. A U.S. flag waves behind Kharkiv, a gift from a friend in New York City. The soldier nods approvingly and uncomprehendingly as Kharkiv speaks in thickly accented, staccato English. “No vodka, no Russia, no Putin. Only Coca-Cola, only Barack Obama,” Kharkiv said. “USA is OK,” he added. Kharkiv, whose father fought with the Soviet Red Army in Afghanistan, stood at a front-line position in Shyrokyne. The perpetual hotspot in the Ukraine war has seen more than a year of trench warfare, including heavy artillery attacks and tank battles. Ukrainian forces dug in here to stop a combined Russian-separatist offensive on nearby Mariupol, a key industrial city on the Sea of Azov. Kharkiv told The Daily Signal that shortly after he raised the U.S. flag in Shyrokyne, combined Russian-separatist troops fired mortars at his position. “It pissed them off,” he said. “The sad part is they probably thought, ‘Look, we were right. It’s the NATO legion; Americans really are fighting here. “Their propaganda is so dumb, sometimes all we can do is laugh about it,” he added. Blaming the Americans Russian propaganda has painted the 2014 Ukrainian revolution as a CIA-sponsored coup to put in place a neo-Nazi regime in Kiev. Some Russian news reports have claimed that U.S. troops and weapons systems, including Apache helicopters, have been fighting for the Ukrainian government in the Donbass, Ukraine’s contested eastern territory on the Russian border. Consequently, for some Ukrainians living in the Donbass with little access to news sources other than Russian ones, America is still the enemy. For them, as for many people living in Russia under the influence of the Kremlin’s propaganda, the Cold War never ended, and Soviet-era paranoia about global CIA conspiracies still runs deep. In August 2014, this correspondent visited the Ukrainian city of Slavyansk less than a month after Ukrainian troops retook the area. Evidence of the fighting was ubiquitous. The skeletons of tanks blown up by landmines sat on roadsides. Bullet and shrapnel holes pockmarked burned out buildings, making some walls look like Swiss cheese. Artillery craters dimpled the asphalt surface of roads like the surface of water in a rainstorm. But the worst damage was in the small village of Semyonovka, just outside Slavyansk. As they retreated from Slavyansk, combined Russian-separatist forces clashed here with Ukrainian troops. The residential blocks of this rural neighborhood resembled a scene from World War II. Almost every house was destroyed. Windows were shattered and nearly every vertical surface was riddled by artillery shrapnel. Trees were stripped bare of branches and leaves, leaving behind only charred trunks. The ground was churned into turbulent piles of black earth, interrupted every so often by the fins of unexploded mortars, which protruded above the surface. Everyday items like pots, pans, and toy dolls were scattered in ruined heaps where artillery detonations had blown them out from the interiors of homes. It was a scene of absolute destruction and a measure of the intensity of this war. Most residents had left before the battle, but a few stayed behind to ride out the fighting in their basements. About a month later, some residents were out on an overcast afternoon trying to salvage what was left of their homes. A simple survey with the help of a translator found that recollections of the battle varied widely among those who had been there for it. Alexandra, 63, hid in her basement for the opening days. But she decided to flee when artillery shredded her home. She returned weeks later to find her home and the entire area in ruins. She blamed the damage on combined Russian-separatist forces and said she was grateful that Ukrainian troops were back in control. “At least it’s better than when the rebels were in charge,” she said. While Alexandra waited for a bus to take her into Slavyansk, across the street a middle-aged woman pushed a wheelbarrow loaded with concrete debris. Her husband and son were nearby, clearing away the walls of their home, which artillery had reduced to rubble. “When the army leaves, there will be the People’s Republic of Donetsk,” the husband responded when asked about his allegiances, referencing one of the self-proclaimed separatist republics. “This is all America’s fault,” his wife said while loading more rubble into the wheelbarrow. The husband said the family had hidden in their basement during the battle. When asked who had destroyed their home, whether it was combined Russian-separatist or Ukrainian artillery, the man’s response highlighted the power of Russian propaganda. Under Soviet rule, American culture was a forbidden fruit in Ukraine and other Soviet states. America, after all, was the enemy. Inside a Soviet-era bomb shelter in Mariupol, the walls are lined with comic book-style illustrations of U.S. fighter jets dropping nuclear weapons on Soviet women and children. “We were training to fight a war with America,” said Igor Bulgakov, 49, a former Ukrainian army lieutenant colonel who served as an officer in the Red Army during the Soviet war in Afghanistan. In post-Soviet Ukraine, however, America and Russia have swapped roles. In 2015, the U.S. Army began training the regular Ukrainian army and National Guard to fight combined Russian-separatist forces. The exercise, called Fearless Guardian, is ongoing at a former Soviet military base in Yavoriv, Ukraine. Meanwhile, Kiev passed a series of sweeping “decommunization” measures outlawing Soviet symbols such as statues of Vladimir Lenin, the hammer and sickle flag, and the Soviet national anthem. The attack of Russia on Ukraine is not only a military attack, it is first and foremost an information attack that was started by the Soviet Union before and continued by Russia as the heir to the Soviet empire. When Bulgakov was a lieutenant in the Red Army, he carried a picture of Lenin in his wallet. “Now I hate Lenin. I hate communism,” he said. Bulgakov retired from the military in 2007, but supports the Ukrainian war effort by driving supplies to troops on the front lines. “We’re in a war with Russia because they’re stuck in a Soviet mindset and we aren’t,” Bulgakov said.